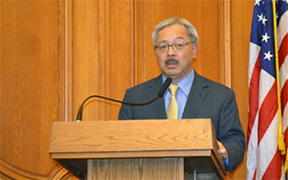 Mayor Edwin M. Lee introduced at the Board of Supervisors the City’s Five-Year Financial Plan (Financial Plan) for Fiscal Years (FY) 2017-18 through 2021-22. Over the next five years, the Financial Plan projects that the City will experience continued economic growth; however, the plan also notes that revenue growth is slowing. The Financial Plan shows that the cost of City services is projected to outpace revenue growth during the five-year period. If the City does not take corrective action, the gap between revenues and expenditures will increase to approximately $848 million by FY 2021-22.